The D Sixth Avenue Express is a rapid transit service in the B Division of the New York City Subway. Its route emblem, or "bullet", is colored orange since it uses the IND Sixth Avenue Line in Manhattan. 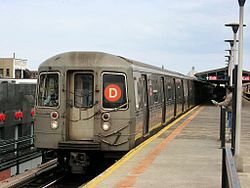 The D operates at all times between 205th Street in Norwood, Bronx, and Stillwell Avenue in Coney Island, Brooklyn. Daytime service operates local in the Bronx and express in Manhattan and in Brooklyn (between Atlantic Avenue–Barclays Center and 36th Street, bypassing DeKalb Avenue). During rush hours in the peak direction, service operates express between Fordham Road in the Bronx and 145th Street in Manhattan. Late night service operates local in the Bronx and Brooklyn (stopping at DeKalb Avenue) and express in Manhattan. In its early years, the D ran to World Trade Center in Lower Manhattan via the lower IND Eighth Avenue Line. From 1954 to 1967, the D ran via the IND Culver Line to Coney Island. With the completion of the Chrystie Street Connection, service was rerouted via the BMT Brighton Line, running there from 1967 to 2001. A short-lived yellow D service ran via the BMT Broadway Line in Manhattan to the Brighton Line in Brooklyn, while orange D service used the Sixth Avenue, Central Park West, and Concourse Lines in Manhattan and the Bronx. A poster showing the temporary DD service that resulted from a water main break. D service began on December 15, 1940 when the IND Sixth Avenue Line opened. It ran from 205th Street, the Bronx to World Trade Center (at that time called Hudson Terminal) on the IND Eighth Avenue Line at all times, switching between the IND Sixth Avenue to the Eighth Avenue Lines just south of West Fourth Street–Washington Square. Service ran express via the Concourse Line during rush hours. D service was increased on October 24, 1949 in order to offset the discontinuation of C service, which ran express via the Concourse Line and the Eighth Avenue Line. On December 29, 1951, Saturday peak direction express service in the Bronx was discontinued. On October 30, 1954, the Culver Ramp, a connection between the IND South Brooklyn Line and BMT Culver Line opened. D service was rerouted via these two lines to Coney Island–Stillwell Avenue with additional trains to Church Avenue on weekdays between 6 a.m. and 6 p.m.. On Saturdays, four round trips ran between 205th Street and Kings Highway. D trains replaced F service on the South Brooklyn Line, and were sent over the new connection as the first IND service to reach Coney Island. The service was announced as Concourse–Culver and advertised as direct Bronx–Coney Island service. Between October 7, 1957 and 1959, limited rush hour trains ran express to Euclid Avenue via the IND Fulton Street Line when the D started being inspected at Pitkin Yard. Four trains left 205th Street between 7:20 and 8:10 a.m., and one left Bedford Park Boulevard at 8:53 a.m.. These five trains returned between 3 and 5 p.m.. During the AM rush hour, several northbound trains ended at Bedford Park Boulevard. From December 4 to 27, 1962, a special service labeled DD was provided due to a water main break. It ran local from 205th Street, Bronx to 59th Street–Columbus Circle, then continued as a local down the Eighth Avenue Line to West Fourth Street, where it switched to the Sixth Avenue Line and continued on its normal route to Coney Island–Stillwell Avenue via the Culver Line. On November 26, 1967, the Chrystie Street Connection opened, connecting the Sixth Avenue Line with the north tracks of the Manhattan Bridge and the BMT Southern Division lines in Brooklyn. In conjunction with this project, the new express tracks on the Sixth Avenue Line between West Fourth Street–Washington Square and 34th Street were opened, providing additional capacity for the extra trains on the IND via the connection. On this date, D service was switched over to BMT Brighton Line via this new connector, running express on weekdays to Brighton Beach and local to Stillwell Avenue at all other times. The D replaced Q service, which had run local in Brooklyn (except during morning rush hours and early evenings) and express on the BMT Broadway Line in Manhattan, terminating at 57th Street. In Manhattan, it ran express from West 4th Street to 34th Street rush hours only, with the B using the express tracks to relay when it terminated at West 4th Street at other times. Service on the Culver Line to Coney Island was replaced by extended F service. On July 1, 1968, it would become the full-time Sixth Avenue Express when non-rush hours B service and new KK service was extended to the new 57th Street–Sixth Avenue station. On August 19, 1968, to reduce conflicts at the Brighton Beach terminal, D service was truncated to Brighton Beach when it ran express on the BMT Brighton Line (morning rush hours through early evenings, and QB (rush-hour peak direction only) and QJ (morning rush hours through early evenings) were extended from Brighton Beach to Coney Island–Stillwell Avenue. In addition, the span of Manhattan-bound D express service was increased by two hours, with the last express leaving Brighton Beach at 7:37 p.m..
1986-1988 Yellow D bullet, serving the BMT Broadway Line. D service was divided and ran in two sections when the north tracks of the Manhattan Bridge closed on April 26, 1986 due to construction, with regular service expected to resume on October 26, 1986. The northern section ran between Norwood–205th Street in the Bronx and 34th Street–Herald Square (the Orange D) while the southern section ran from 57th Street–Seventh Avenue on the BMT Broadway Line, then express along the Broadway Line to Canal Street, then over the south tracks of the Manhattan Bridge into Brooklyn, and then along the Brighton Line to Stillwell Avenue (the Yellow D). Service to Grand Street was replaced by the S shuttle, which ran via the Sixth Avenue local to 57th Street–Sixth Avenue. At this time, the local tracks on the BMT Brighton Line also underwent reconstruction, necessitating the suspension of express service. As a substitute, the D and Q ran skip-stop service between Newkirk Avenue and Sheepshead Bay on weekdays. D trains served Neck Road, Avenue M and Avenue H; the Q skipped those stops, serving Avenue U and Avenue J, while both trains served Kings Highway. The first skip-stop train left Brighton Beach at about 6:30 a.m. while the last one left 57th Street–Seventh Avenue at about 7:30 p.m.. On weekday evenings, between 8 p.m. and 1 a.m., D trains made all local stops, except Parkside Avenue and Beverley Road where service was only available in one direction. During late nights and weekends, D trains ran express between Prospect Park and Kings Highway depending on which tracks were being worked on. By 1987, as reconstruction on the Brighton Line progressed, the weekday skip-stop pattern expanded to Prospect Park, with D trains serving Beverley Road while Q trains served Cortelyou Road and Parkside Avenue, with Church Avenue as a mutual station. On December 11, 1988, the north tracks of the Manhattan Bridge reopened and the two sections of the D joined together running via Sixth Avenue Express. The D now ran as the full-time Brighton Local to Stillwell Avenue. From April 30 to November 12, 1995, the Bridge's north tracks closed during middays and weekends and during these hours, D service was cut south of 34th Street-Herald Square. In its place, the Q ran local in Brooklyn to Stillwell Avenue. On July 22, 2001, the north tracks were closed at all times and the southern (Broadway Line) tracks reopened. D service was again cut below 34th Street-Herald Square. In Brooklyn, D service was replaced by Q local service. After September 11, 2001, C service was suspended. On weekends, the D ran local on the Eighth Avenue Line north of 59th Street to fill in the gap in service caused by the suspension until September 21. On February 22, 2004, full service on the Manhattan Bridge was restored and D trains were extended via the north tracks of the bridge to Brooklyn, replacing the W as the Fourth Avenue Express (late nights local) and West End Local to Coney Island–Stillwell Avenue. The D was moved to the West End Line instead of returning to the Brighton Line, which it had run on since 1967, to provide 24-hour service to both the Concourse Line and West End Line and avoid running two separate (B and D) shortened services outside of weekdays. This eliminated the need to run late-night and/or weekend shuttles on the West End Line as done prior to 2002. From May 24, 2004 to Fall 2004, signal modernization on the IND Concourse Line required the suspension of D express service in the Bronx. Bob Dylan's 1966 song "Visions of Johanna" includes the lyric "In the empty lot where the ladies play blindman's bluff with the keychain/And the all-night girls, they whisper of escapades out on the D train." At the time, the D used the IND Culver Line to Coney Island. Biz Markie's song "Pickin' Boogers" from his debut album Goin' Off features the line "I was chillin one day/with my partner Kane/headed up to the rooftop/ridin' the D train." The opening track on Yoko Ono's 2009 album Between My Head and the Sky is titled "Waiting for the D Train". The D passes through 72nd Street (opposite her apartment in the Dakota Building) but never stops there, as it is a local station. In the late 1980s and early 1990s, numerous Top 10 Lists on Late Night with David Letterman contained references to the D train. The service is mentioned in the song "Boogie Down "by Man Parrish Ft. Freeze Force (MC John Ski) raps the following line: "You take the D to 205th Then go see me 'cause I got the gift And I'm the cool MC with the vicious sounds I'm not from the Bronx, but I still Boogie Down". The service is mentioned in the song "3 The Hard Way" by Beastie Boys. Adam Yauch raps the following line: "Used to ride the D to beat the morning bell at Edward R. Murrow out on Avenue L..." (Referring to Edward R. Murrow High School, where the D served the station closest to the school, Avenue M, until 2001, when it was replaced by the Q). The service is mentioned twice in the song "Stop That Train" by the Beastie Boys. Mike D and Adrock rap the following line: "Same faces every day, but you don't know their names, party people going places on the D train". Adam Yauch raps the following line: "Groggy-eyed and fried, and I'm headed for the station, D train ride to Coney Island vacation." The eponymous character of Seinfeld uses the D train to go to Coney Island in the episode "The Subway". The 1980s folk-pop trio The Washington Squares includes a song titled "D Train" on their eponymous 1987 debut album. Type O Negative refer to the D train as the chosen transport to Brighton Beach, where lead singer Peter Steele will kill his girlfriend in their songs "Xero Tolerance," "Hey Pete", and "Kill You Tonight". It is also mentioned in an episode of The Penguins of Madagascar called "Gone In A Flash" where the penguins go to rescue Maurice and have to travel through the subway system. Also, in episode "Dr. Blowhole's Revenge", when Julien is kidnapped by the lobsters, Mort starts his travel to save him by using the metro until Coney Island. Man Against Crime episode "Third Rail" (S4E19) starring Ralph Bellamy was filmed on the D train and at the 207th Street Yard in 1953. Jean-Michel Basquiat generated much interest in his graffiti art, which took the form of spray-painted aphorisms that were targeted at the D train. ^ Some northbound trains terminate at this station during a.m. rush hours; some southbound trains originate at this station during a.m. rush hours. ^ a b "D Subway Timetable, Effective November 4, 2018" (PDF). Metropolitan Transportation Authority. Retrieved February 28, 2019. ^ "City's Subways Are Complete. 6th Ave. Line Set to Open On Sunday". New York Daily News. December 13, 1940. Retrieved April 5, 2019. ^ "IND Faster Service Will Start Sunday" (PDF). The New York Times. October 20, 1949. ISSN 0362-4331. Retrieved February 20, 2016. ^ a b Linder, Bernard (October 1968). "Independent Subway Service History". New York Division Bulletin. Electric Railroaders' Association. ^ "Bronx to Coney Ride In New Subway Link" (PDF). The New York Times. October 18, 1954. ISSN 0362-4331. Retrieved February 20, 2016. ^ a b Linder, Bernard (December 1968). "Independent Subway Service History". New York Division Bulletin. Electric Railroaders' Association. ^ a b Sparberg, Andrew J. (October 1, 2014). From a Nickel to a Token: The Journey from Board of Transportation to MTA. Fordham University Press. ISBN 978-0-8232-6190-1. ^ "Adequate Transit Promised For City; Authority Head Writes Mayor and Sharkey Denying Cuts Will Be 'Indiscriminate'". The New York Times. October 29, 1954. p. 25. ISSN 0362-4331. Retrieved April 5, 2019. ^ "Emergency IND Service Water Main Break Halts Service At IND 6th Avenue 14th St. and 23rd St. Stations". New York City Transit Authority. December 7, 1962. Retrieved April 5, 2019 – via thejoekorner.com. ^ "Subway Route Changes Put in Effect; Capacity Increased". The New York Times. November 26, 1967. ISSN 0362-4331. Retrieved July 26, 2017. ^ Perlmutter, Emanuel (November 16, 1967). "Subway Changes to Speed Service: Major Alterations in Maps, Routes and Signs Will Take Effect Nov. 26" (PDF). The New York Times. ISSN 0362-4331. Retrieved July 7, 2015. ^ "New Subway Routes Brochure". New York City Transit Authority. November 1967. Retrieved January 24, 2016 – via thejoekorner.com. ^ "5 Fast Lines To Coney". New York Daily News. August 18, 1968. Retrieved April 5, 2019. ^ Washington Heights, Central Park West And Grand Concourse Riders Your Guide To Service Changes On The B D During Rehabilitation Work April 26 Through October 26, 1986. New York City Transit Authority. April 1986. ^ "The JoeKorNer Brochures". Retrieved February 8, 2018. ^ Brighton Line Riders Your Guide To Service Changes On The B Q M During Rehabilitation Work April 26 Through October 26, 1986. New York City Transit Authority. April 1986. ^ Mader, Stewart. "NYC Subway Maps Have a Long History of Including PATH, NJ Waterfront". stewartmader.com. Retrieved February 9, 2018. ^ "System-Wide Changes In Subway Service Effective Sunday, December 11, 1988". New York City Transit Authority. December 1988. Retrieved June 17, 2016 – via Flickr. ^ Ronald Sullivan (March 26, 1995). "Bridge Repairs to Disrupt Off-Peak Subway Service". The New York Times. ISSN 0362-4331. Retrieved July 2, 2016. ^ "B D S Manhattan Bridge Service Change Timetable" (PDF). mta.info. Metropolitan Transportation Authority. April 2003. Archived (PDF) from the original on June 29, 2003. Retrieved April 5, 2019. ^ "MTA NYC Transit Manhattan Bridge Information". mta.info. Metropolitan Transportation Authority. February 5, 2004. Archived from the original on February 5, 2004. Retrieved September 18, 2016. ^ "A Subway Map Remade, in Hopes of Matching Routes and Riders". The New York Times. February 20, 2004. ISSN 0362-4331. Retrieved June 9, 2014. Wikimedia Commons has media related to D (New York City Subway service). "D Subway Timetable, Effective June 24, 2018" (PDF). Metropolitan Transportation Authority. Retrieved June 24, 2018.